Seeds provide an efficient means in disseminating plant virus and viroid diseases. The success of modern agriculture depends on pathogen free seed with high yielding character and in turn disease management. There is a serious scientific concern about the transmission of plant viruses sexually through seed and asexually through plant propagules. The present book provides the latest information along with the total list of seed transmitted virus and viroid diseases at global level including, the yield losses, diagnostic techniques, mechanism of seed transmission, epidemiology and virus disease management aspects. Additional information is also provided on the transmission of plant virus and virus-like diseases through vegetative propagules. It is also well known that seed transmitted viruses are introduced into new countries and continents during large-scale traffic movements through infected germplasm and plant propogules. The latest diagnostic molecular techniques in different virus-host combinations along with disease management measures have been included. The book shall be a good reference source and also a text book to the research scientists, teachers, students of plant pathology, agriculture, horticulture, life sciences, green house managers, professional entrepreneurs, persons involved in quarantines and seed companies. 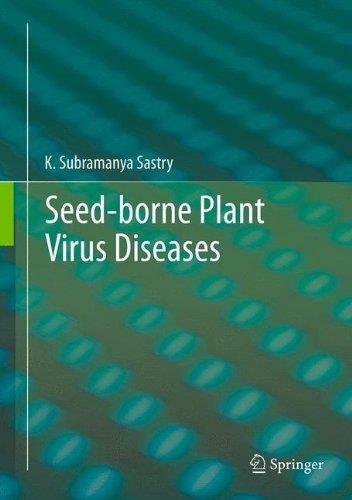 This book has several important features of seed transmitted virus diseases and is a good informative source and thus deserves a place in almost all university libraries, seed companies and research organizations.